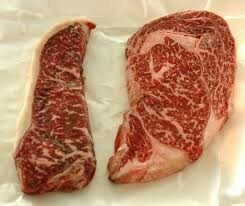 These generously marbled steaks are always delectably tender and juicy. Wonderful on the grill or easily cooked indoors. A sure bet to amaze the guests at your next event! 2. Mix in large bowl the butter, sugars, vanilla extract and pudding. Beat until very smooth and creamy. 3. Beat in remaining ingredients (eggs, flour, and baking soda). Fold in chocolate chips last. 4. Drop by tablespoon onto ungreased cookie sheet. Bake 8 minutes. DO NOT OVERBAKE. For the Garlic Fingerling Potatoes: Preheat a heavy metal baking dish in a 375° oven. Toss the potatoes, garlic, olive oil, and chervil with salt and pepper. When the pan is hot, add the potatoes. They should sizzle. Roast until they turn brown, then turn oven down to 350°. Cook for about 30 minutes or until a knife easily pierces the spuds.